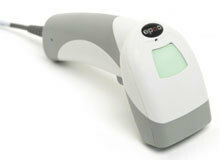 Our first product that we are adding to our range to complete our package is the CR1400 barcode scanner.The innovative design of the Reader makes it one of the smallest, most durable bar code readers on the market today. If your Pcs are being updated to Windows 7 contact us now to find out how to get upgraded to our latest software so your system will continue to work. Exciting things being launched this week keep watching to find out what we are adding to our product range.